The Highland Park Community Council Kids’ Committee is hosting its annual 4th of July Parade. Kids of all ages are invited to decorate their bicycle and then show off their handy work with a parade around the fountain. When: July 4 at 10 a.m. Volunteers to help the little ones with decorations and to fill helium balloons are needed. 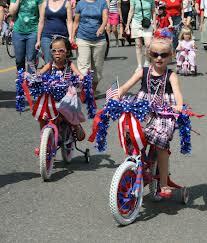 We are also accepting donations of red, white and blue decorations for the children to use to decorate their bikes. Please contact Teri Rucker (terirucker@yahoo.com) if you are interested in volunteering or have something donate. Supplies also can be dropped off at the side porch of 5914 Wellesley Ave.
← HPCC Meeting Reminder – Thursday, June 20th at 7PM at Union Project.